Being an Englishman in Scotland has its moments of charm, and as someone who’s travelled to its more… rustic areas, I can safely say that if you want to understand the accent, keep to Edinburgh. It’s a city as old as any other of the big British capitals and holds as much history and culture – as evidenced by the galleries, operas, and bars, all three of which I sampled on this trip. Edinburgh, more than any other, is a city in which I could see myself living. The architecture encompasses both the old and the new, meaning the banks are made of glass but the streets are still cobbled, so that’s nice. Aside from the worn stone and Banksy re-sprays, it certainly gives you a warm feeling. My trip included a visit to the Scottish Opera’s production of The Mikado, a Gilbert and Sullivan that uses subtle racism to trick people into a political story (for a more contemporary example, please see Farage’s most recent behaviour during the Brexit debacle). However, the show itself was entertaining, and as someone who breached six feet tall when I was still a child, I’m sure the audience behind me enjoyed the songs, dances, and my huge ginger head. From the opera I was feeling suitably upper-middle class, swinging my coat and clicking my boot heels on the stone, but this illusion was shattered in true drunk Englishman style with a large kebab eaten on the train back. No amount of opera can turn a boy away from greasy ‘meat’ and a very large order of chips. Edinburgh, in its own quaint way, has a tram service running through the city. Costing an amount that makes every Scot roll their eyes, it’s a fixture of transport, exasperation, and public abuse. Unfortunately, I was the abuser this time. A stop along the tram’s service line was Murrayfield Stadium and we travelled on match day. With each person rammed against each other in a level of intimacy I usually make people pay for, it was my displeasure to move my hand (reaching for a pole to steady myself) and slap a stranger in the face. Now I can assure you, reader, this wasn’t a tap, in fact I watched as the sunglasses of this poor woman clattered to the floor – and I simply froze. She said nothing. I said nothing. The stop came and the majority of people departed, in doing so leaving me face to face with a stranger I had accosted like a disgruntled pimp. In our awkwardness she walked away, saying nothing, and I took a seat, also saying nothing. To that woman, wherever you are, I am sorry (sort of, I actually find it very funny now, and I tell this story frequently), but I do hope your black eye wasn’t too bad and that you knew it was an accident. The Scottish National Gallery finds itself mostly silent when I’m not there, and tourists find themselves indulging in art and finery. However, after the opera I was all out of class. Instead I took my trip as the chance to compare each masterpiece to contestants on RuPaul’s Drag Race, which, if you haven’t seen it, is a wonderful show all about the joys of drags queens and their associated tomfoolery. Though, in my defence, if those 17th century lords didn’t want to be compared to drag queens, then they shouldn’t have worn tights, or worn them so well. After so much excitement it was time to have a drink. 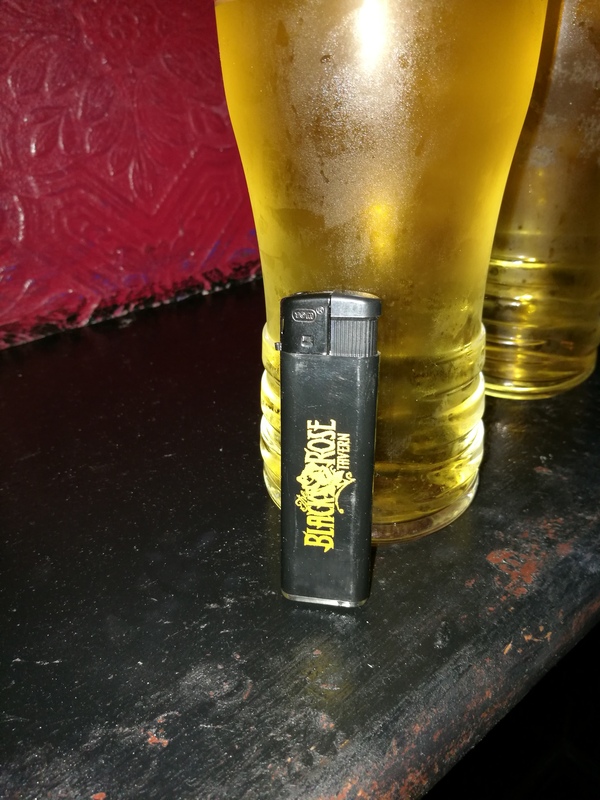 A bar up the hill and round the corner gave us the opportunity to engage in an ice cold pint – The Black Rose blurs the line between your local and the dive bar in town, which suited me nicely, and of course their personalised lighters were perfect for this article.